For more than 60 years, GRC Mechanical has been meeting the commercial HVAC/R needs of businesses and organizations in Bergen County, New Jersey, Rockland County, New York and surrounding areas. Our skilled commercial HVAC/R professionals will quickly be able to diagnose and troubleshoot any repair needed on your system. They will also be able to help you choose the best, most energy efficient commercial HVAC/R products for your business or organization, as well as your budget. Finally… a commercial HVAC/R contractor you can depend on to get the job done right the first time! For your convenience, we are available online to take quotes and even schedule service. 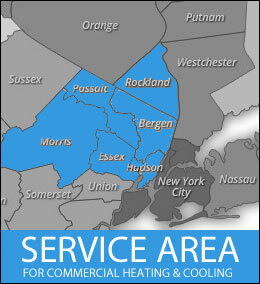 Please review the service area tab below to learn about the wide range of commercial HVAC/R services we offer. Please fill out this form for a commercial HVAC/R quote and one of our representatives will get back to you within 24 hours. If you need service on your commercial HVAC/R system, fill out the following form and one of our representatives will answer you within 24 hours.